This Bear & Son 4th Generation Cowhand pocket knife is outfitted with a 3.75" stainless steel handle with heritage walnut scales and a satin finished 1095 stainless steel blade. Nickel silver bolsters and a 4th Generation inlay shield finish the handle and give it a classic, collectible look. It provides a sturdy lockback design that makes for a great EDC or outdoor pocket knife. 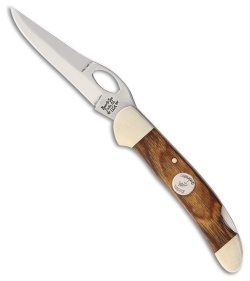 Satin finished 1095 steel drop point blade with thumb hole opening. Heritage walnut handles with nickel silver bolsters, a 4th Generation inlay shield and a lock back mechanism. Item includes a satin finished stainless steel pocket clip for tip-down carry.